Mrs. Mary B. McQuesten, widow of the late Isaac B. McQuesten, died this morning at her home, "Whitehern" Hamilton, in her eighty-sixth year.1 Mrs. McQuesten was born in Brantford, the daughter of Mary McIlwaine and Commander Thomas Baker R.N.,2 who served as first Lieutenant on H.M.S. St. Lawrence in 1814 on Lake Ontario and for many years later a Missionary in Upper Canada of the London Missionary Society of the Presbyterian Church in Canada and later served as a Vice President of the Provincial society. She was President for upwards of twenty-five years of MacNab [sic] Street Church Auxiliary and Honorary President of the Hamilton Presbyterial Society. Surviving her are her daughters, Miss Mary B. McQuesten, Miss Hilda B. McQuesten and Miss M.E. [Margaret Edna] McQuesten and her sons, the Rev. Calvin McQuesten and T.B. McQuesten.3 A Private service will be held at the home of Monday afternoon at 2.30 o'clock. Public service at MacNab Street Presbyterian Church at three o'clock. A church, a city, and a home deeply mourned when Mrs. McQuesten passed away at her residence in Hamilton, on December 7th. She had reached the age of eighty-six years,4 a very long and most worthy life. She was the widow of Isaac D. McQuesten5 and mother of Hon. T.B. McQuesten, Minister of Highways in the Ontario Cabinet. She was born in Brantford, Ont., the daughter of Commander Thomas Baker, R.N., who after his naval carrer [sic] served as a missionary in Upper Canada, Under the London Missionary Society. Mrs. McQuesten was very intimately related to the work of the Church. She was one of the founders of the Women's Foreign Missionary Society of the Presbyterian Church in Canada, and later served as Vice-President of the Hamilton Presbyterian Society. She was deeply interested in and active in public affairs, particularly in matters that concerned the city of Hamilton. She was well known for her support of the Lord's Day Alliance, and her interest in the preservation of the Lord's Day. Her minister, Rev. H.B. Ketchen, D.D., of McNab [sic] St. Church, at the funeral service, paid her very high tribute, but wholly in keeping with her character and career. Dr. Ketchen said, "For nearly three-score-years-and-ten she has been one of the most conspicuous Christian workers and spiritual forces, not only in this congregation and community, but in the Church at large. She came to the church as a young and strikingly beautiful bride, and although her life had been unusually trying, that singular loveliness was in her face to the last. As the spirited daughter of a Commander in the Royal Navy, she knew how to weather stormy seas and to fight a good fight. Her rare and steadfast courage was doubtless more deeply rooted in her unshakeable faith in God from whom by daily comunion [sic] she gathered strength and guidance as needed through the years. Blended in her were inflexible integrity and the kindliness and graciousness of the true lady. Known to many only in her public life, it was in her home that she was at her best where her wit sparkled most, and where her sweet gentleness overshadowed her cleverness. Her memory will ever be cherished with reverence and affection. There will be widespread sympathy with Hon. T.B. McQuesten, Provincial Minister of Public Works and Highways, on the loss of his mother, who passed away in Hamilton on Thursday night at the age of 85. Mrs. McQuesten was a woman of beautiful character, high culture, and wide interests. While home and family were her first concern, she devoted much of her time and ability to the activities of MacNab Street Presbyterian Church and to missionary work. Throughout her long and active life Mrs. McQuesten made for herself a host of friends, and to them her death will be a great loss. In the passing of Mrs. McQuesten, the Presbyterian church has lost a devout and faithful daughter, and the mission field one who was ever on the alert to help the cause. Mrs. McQuesten's advice, always considered and wise, was much sought on many matters, and in the organizations in which she was such a power her loss will be keenly felt. No woman in Canada, probably has filled high offices with such dignity, ability and tact; and her gentle personality and wide sympathies made her beloved far beyond the confines of her own city. A pattern of Victorian womanhood, her home and family and her church constituted her world, and in all that pertained to them she upheld by her life and works, her own high and impregnable sense of duty. Many friends will mourn her. Mrs. Mary B. McQuesten, widow of Isaac B. McQuesten, died this morning at her home, Whitehern, Hamilton, in her 86th year. Mrs. McQuesten was born in Brantford, the daughter of Mary McIlwaine and Commander Thomas Baker, R.N., who served as first lieutenant on H.M.S. St. Lawrence n 1814 on Lake Ontario, and for many years later a missionary in Upper Canada of the London Missionary society. Mrs. McQuesten was one of the founders of the Women's Foreign Missionary society of the Presbyterian Church in Canada, and later served as a vice-president of the provincial society. She was president for upwards of twenty-five years of MacNab street church [sic] auxiliary and honorary president of the Hamilton Presbyterial society. Surviving her are her daughters, Miss Mary B. McQuesten, Miss Hilda B. McQuesten and Miss M.E. McQuesten, and her sons, the Rev. Calvin M. McQuesten6 and Hon. T.B. McQuesten. A private service will be held at her home on Monday afternoon at 2.30 o'clock. Public service at MacNab Street Presbyterian Church at 3 o'clock. Interment will be made in Hamilton cemetery. A prominent figure for many years in the W.M.S. of the Presbyterian church, whose death occurred last evening at her home, 41 Jackson street west. Her passing will be the occasion of the deepest regret in many walks of life where her beneficent influence was felt. [Caption:] One of the founders of the Women's Foreign Missionary society of the Presbyterian church in Canada, and mother of Hon. T.B. McQuesten, Provincial Minister of highways and public works, Mrs. Mary B. McQuesten passed away here this morning in her 86th year. Innumerable friends and acquaintances throughout Canada today mourn the death of one of Hamilton's best loved citizens, Mrs. Mary B. McQuesten, aged mother of Hon. T. B. McQuesten, minister of highways and public works, who passed away suddenly at her home, "Whitehern," 41 Jackson street west, early this morning, at the age of 86 years. Born in Brantford, the daughter of the late Mary McIlwaine and Commander Thomas Baker, R.N., who served as first lieutenant on H.M.S. St. Lawrence in 1814 on Lake Ontario, Mrs. McQuesten for many years laboured as a missionary in Upper Canada, being connected with the London Missionary society. She was one of the founders of the Women's Foreign Missionary society of the Presbyterian church in Canada and later served as vice-president of the provincial society. Possessed of a sweet disposition, which endeared her to all with whom she came in contact, the late Mrs. McQuesten was devoted to her family, her home and her church, and will be affectionately remembered with the passage of time for her unostentatiously Christian, motherly qualities. Like her distinguished son, she was a lover of nature and in her declining years her garden was one of her greatest delights. To her Hon. Mr. McQuesten has frequently attributed much of the credit for his success in life and for the civic beautification plans he has from time to time put into effect. Always actively connected with church work, especially in the missionary field, Mrs. McQuesten was for 25 years president of the Macnab St. Presbyterian church auxiliary and honorary president of the Hamilton Presbyterial society. Besides a host of friends in all walks of life, she leaves three daughters, Mary B. McQuesten, Miss Hilda B. McQuesten and Miss M.E. McQuesten, all living at home, and two sons, Rev. Calvin McQuesten, chaplain at the Mountain Sanatorium, and Hon. T.B. McQuesten. A private funeral service will be held in the family home on Monday afternoon at 2.30 o'clock. This will be followed by a public service in Macnab [sic] Street Presbyterian church, with Rev. Dr. Ketchen officiating. Burial will take place in the Hamilton cemetery. There was a large gathering of ministers and deputy ministers of the Ontario Legislature and others prominent in the public life of the province at the funeral service of Mrs. Mary B. McQuesten, mother of Hon. T.B. McQuesten, minister of highways and public works, held this afternoon in Macnab Street Presbyterian Church. Premier Mitchell Hepburn was unable to attend, owing to his being at present on holiday in Bermuda, but he was represented by Hon. Harry C. Nixon, provincial secretary and acting premier. Others present included: Hon. Arthur W. Roebuck, attorney-general; Hon. L.J. Simpson, minister of education; Hon. Paul Leduc, minister of mines; Hon. Duncan Marshall, minister of agriculture; Hon. A.J. Faulkner, minister of health; Hon. Peter Heenan, minister of lands and forests; C.S. Walters, deputy minister of highways; A.A. Smith, chief engineer; G.E.F. Smith, chief accountant and George White, chief architect of the highways department. Mayor Wilton represented Hamilton and W.D. Black and John Newlands the Hamilton Hydro Board. Others who attended the funeral were: Senator E.S. Little, of London; Senator A.C. Hardy, of Brockville; J.P. Bickell, registrar of motor vehicles; William Houk, M.L.A. ; J.C. Jerman, Dr. Snyder, Lorne Brown, Toronto; Hon. David Croll, minister welfare, was in Windsor and unable to be present. The service was in charge of Rev. Dr. Beverley Ketchen and the choir led the singing of the 23rd psalm and the hymn "There Is a Land of Pure Delight," both favourites of the deceased lady. Robert C. Symmers presided at the organ and played the "Dead March in Saul," and several well known numbers from the oratorios. In his eulogy of deceased,8 Dr. Ketchen said, in part: "Mrs. McQuesten had a real puritanical sense of right and wrong. her uncompromising conscience would not countenance anything that was not utterly honorable [sic], but with all that inflexible integrity was blended a very great kindliness and the graciousness of the true lady. She was an aristocrat by birth and breeding and an aristocrat intellectually and spiritually too. "Many of you who knew her only in public life saw perhaps only the brilliant side of her, but it was in the home that she was at her best, where her wit sparkled most and where her gentleness overshadowed her cleverness. To see her in the home or about the garden she loved was to think inevitably of lavender and old lace." 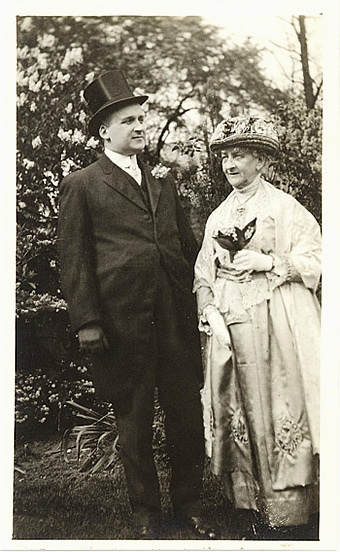 Dr. Ketchen also referred at length to Mrs. McQuesten's great work for the W.M.S. The church service followed a short service at Hamilton cemetery. The pallbearers were Dr. Norman Leslie, C.W. Bell, M.P. K.C. ; James Chisholm, K.C. ; William James, Holton Whittemore and Dr. J.H. Mullin. 1 See Box 08-183 for the letter from the Canadian Clipping Service that collected all of these clippings for Thomas McQuesten. The original document is undated, but has been given the date of Mary's death, December 7, 1934. (W7171) A one page document in Rev. Calvin's handwriting is a record (or partial record)of "Acknowledgement of Sympathy (for flowers)"
2 Rev. Thomas Baker had been a commander in the Royal Navy before being ordained as a minister. 3 Another daughter, Ruby, had died on April 9, 1911 after a three year struggle with tuberculosis. See W6135, W9058. 4 Mary Baker McQuesten had been born on October 10, 1849, so she was in fact 85 years old--or, one might say, in her 86th year--when she died. She was not, however, 86 years old. Several of the enclosed clippings make the same error. 5 This is an error, Mary's husband was Isaac Baldwin McQuesten. 6 The middle initial "M." is a mistake as Calvin did not have a middle name. 7 In 1925, the members of the Presbyterian, Congregational and Methodist Churches voted to join and become the United Church of Canada. The vote was not unanimous, Hamilton members in particular voted strongly against it, strongly influenced by Mary and her son Thomas who were both very vocal opponents of Union. See W0127a, W5283. However, Rev. Calvin McQuesten was just as vocal in favour of union and he actually became the United Church chaplain for the Hamilton Sanatorium (Tuberculosis) from 1920 to 1950). The strongest arguments for union came from the west where ministers had to travel long distances on a Sunday to deliver sermons at several very small churches and congregations. Calvin had been one of these itinerant ministers travelling to three churches on horseback on a Sunday to minister to his congregations. Other protestant denominations were doing the same.